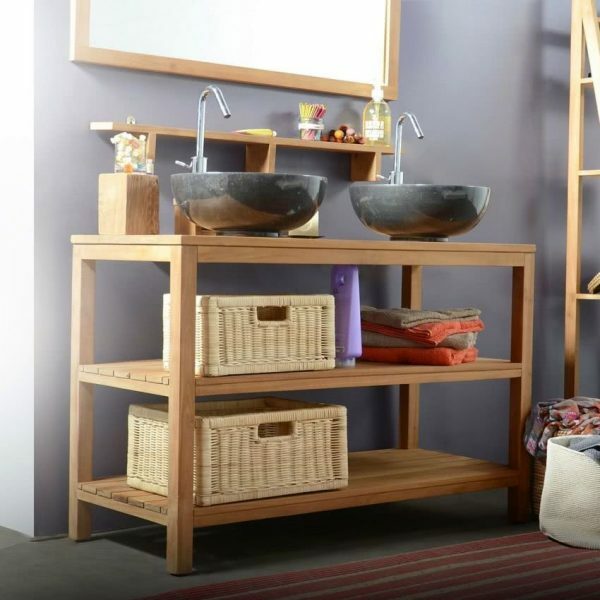 Bathroom furniture is essential for storing towels and toiletries. You can find everything from cheap options to custom-made furniture. 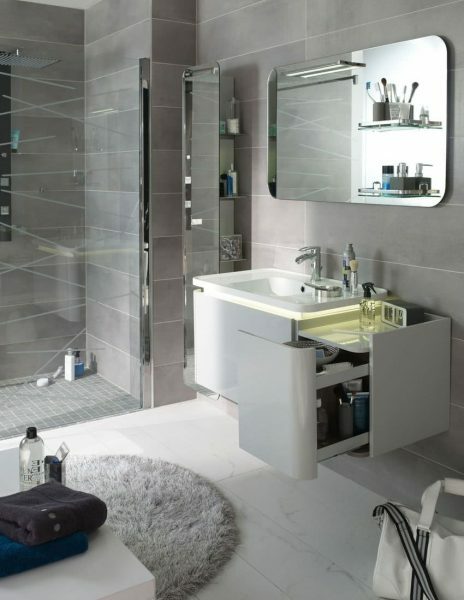 Here you will find some tips to choose the perfect furniture for your bathroom. The ergonomics of the furniture must be designed to serve the need. 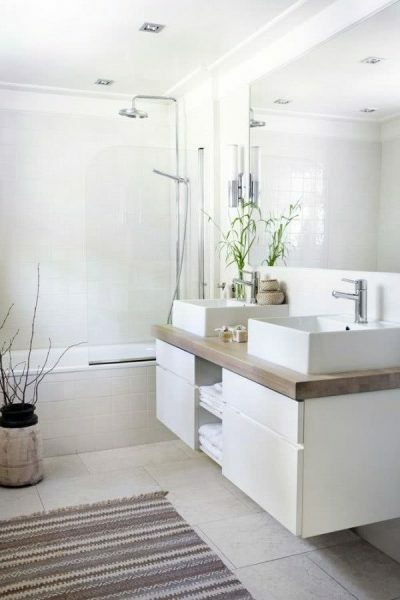 They should be chosen according to the space available, the need for storage and the configuration of the bathroom. You also have many styles to choose from, modern, rustic, contemporary or minimalist, as well as different materials and finishes, assemblies and accessories. The open bathroom furniture does not have doors or drawers. For this reason they are especially suitable for storing products that are used several times a day, such as toothbrush, comb and hairbrush, etc. They are installed at the height of the user to facilitate access. Shelves and other open furniture can accommodate boxes of cloth or other materials, which are usually very practical because they are independent, they can be moved from one place to another with ease. 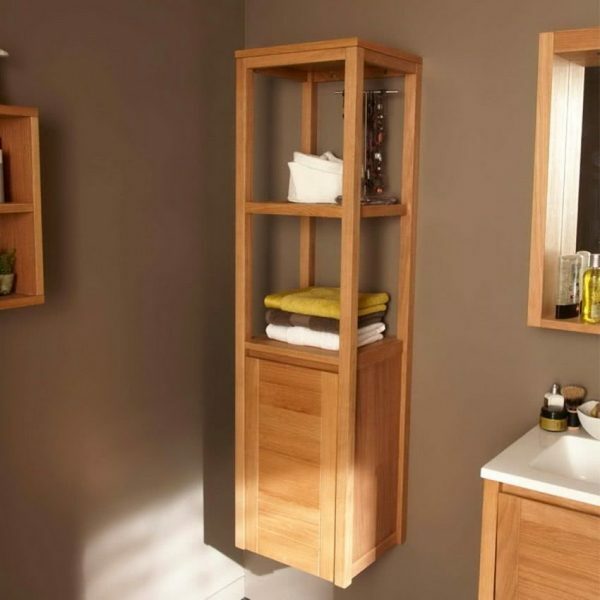 Bathroom furniture with drawers requires a space for opening. The drawers should be accessible and should be placed at a height between 80 and 110 cm for greater comfort. You can also add a subdivision or separation for more efficient storage. They are used to store accessories and personal care products, such as the hair dryer, electric razor, etc. The furniture with doors are multipurpose. The height of your installation determines the type of accessory that will be stored there (towels at the bottom, daily accessories at the height of the user, for example. The hooks on the doors offer effective alternatives for hanging light, bulky and everyday products: cotton, make-up remover, etc. Whether hanging or standing, straight or angled, low or high, the shelves of the bathrooms are usually offered between two and five shelves. The column type furniture is compact, occupies an optimal space and offers great storage capacity. It can be hanging or not, and may have drawers, doors or open spaces, your configuration will be chosen according to the design of the bathroom. The lower compartment can be used to place the washing machine, while the upper part can be a storage space for toiletries. The bath column can be fixed to the wall for greater stability. 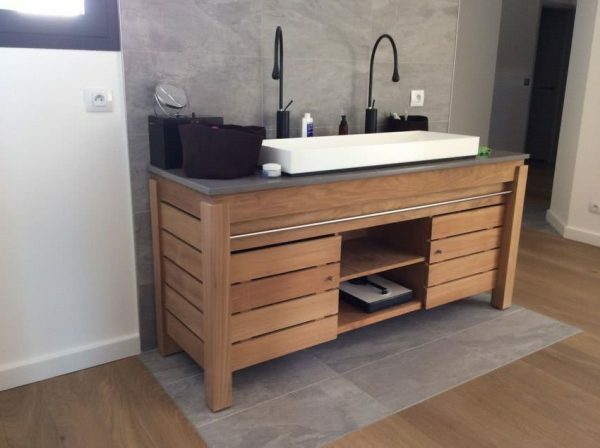 The vanity unit can carry the built-in washbasin or it can simply be under the suspended washbasin. Its dimensions must not exceed the depth of the sink or sink. It can carry drawers, doors or shelves. It must allow access to the drainage system or siphon. The low furniture is usually used for towels, bath mats or toiletries. For this reason, compartments are not placed to have more volume available. They can have different configurations: one or several doors or mirrors, drawers or shelves, lighting (with LED, halogen tube or light bulb). Of variable dimensions, it must hang over the sink and is shallow. 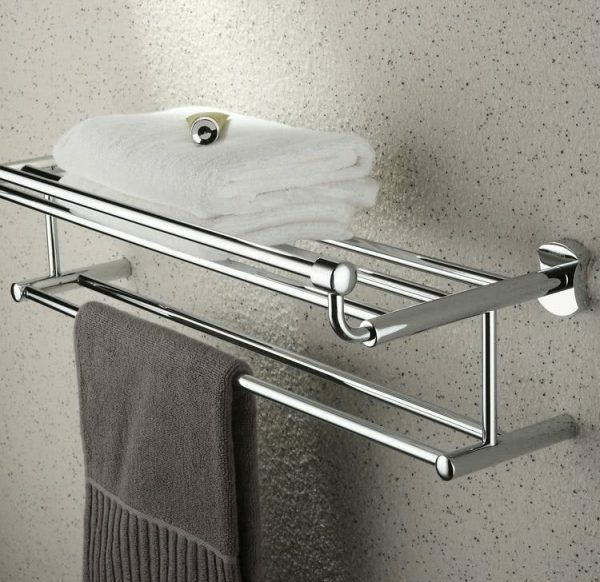 The towel rails can be placed on the doors of the furniture or on the wall. Suspended bathroom furniture free space and facilitate cleaning. 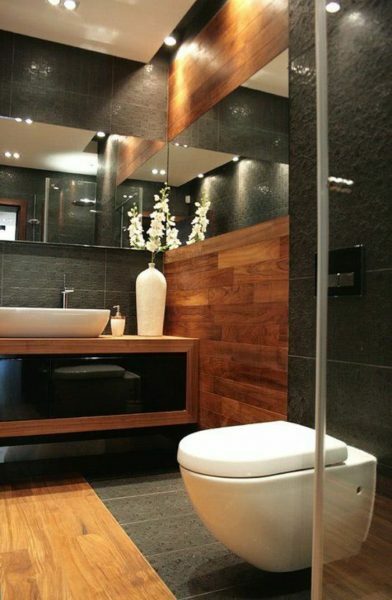 They adapt very well to small bathrooms, their installation height depends on their format and the use that is made of it. This type of furniture occupies a space in the floor and, therefore, reduces the useful area. Small bathrooms will look even smaller, so they are not recommended. If it is equipped with wheels, and, provided it is resistant, it can be used as a stool. Generally, designed with one or two drawers, it can be housed in a corner or in the bottom of a piece of furniture. The bathroom furniture can be made in different materials, from natural wood, MDF, melamine, rattan, wrought iron or glass. But the two main materials that stand out in the manufacture of bathroom furniture, are solid wood and composite materials. Composite materials allow more modern and clear forms. Its price is also, generally, lower, however, its quality is lower and its manufacturing process has an impact on the environment. Namely, natural wood is easier to handle than MDF. Aerated structures are more difficult to clean and the fragile nature of the glass should be taken into account in the choice of a shelf. Materials that are easy to clean are recommended. The solid wood furniture can be of different species, however, we note that exotic woods predominate for their intrinsic properties: ease of maintenance and resistance to putrefaction. 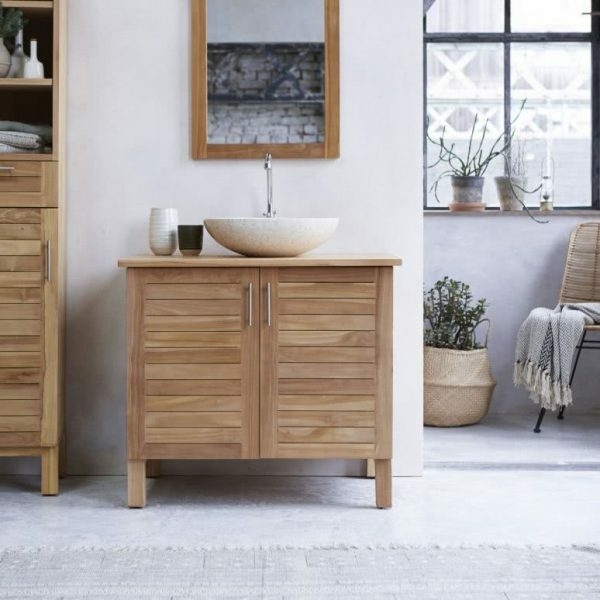 Most solid wood bathroom furniture is made of teak, eucalyptus, mahogany or bamboo. However, it is advisable to apply oil, lacquer or varnish on the wood, which will guarantee its protection. Bathroom furniture in melamine or chipboard are the most common and cheap. Manufactured with wood particles glued under pressure and covered with laminate of different decorations: white, anthracite, walnut, beech, wenge, pine, etc. Melamine can be lacquered with a modern paint in colors such as red, green, aluminum, etc. and have a glossy, metallic, satin or matt finish. Some care should be taken that they do not get too wet, as they may swell and lose their original shape. It is a heavier and stronger composite material than melamine. Made of wood fiber and a binder, the MDF is subjected to high pressures and temperatures. Like melamine, the MDF is covered with a decoration and most of the time lacquered. It is more expensive, it is used for furniture of better quality. The dimensions of the furniture depend on the available space and it is recommended not to oversize the furniture. Too big furniture in a small bathroom is not attractive and gives a feeling of confinement. 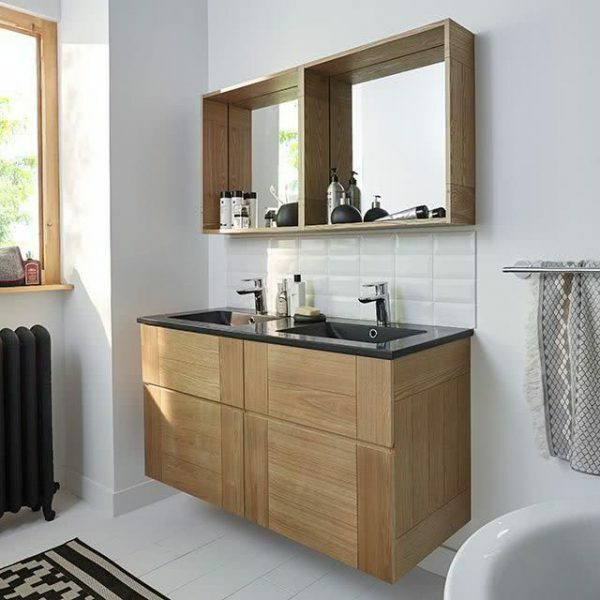 Bathroom furniture in composite materials, melamine or MDF, can be cleaned with a sponge or with a damp cloth and soapy water. Ammonia degreases the surfaces of these furniture well. Exotic wood furniture such as teak can be cleaned with water and a brush. If the wood is really stained, you can lightly sand it and then apply oil again. In both natural wood and composite materials, do not use aggressive products and make sure to rinse thoroughly after cleaning.